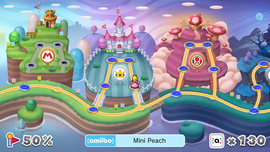 Balloon Float Castle is Mini Peach's world and the fifth world overall in Mini Mario & Friends: amiibo Challenge. The main mechanic featured in this world are balloons which allow Mini Peach to float and can be popped by tapping the screen, as its name shows. Mini Peach's special ability in this world is the Floating Jump which has been seen in many other games. One main level also takes place before this world, Level 6. The background featured in this world is styled after New Super Mario Bros. Wii and has Princess Peach's Castle and the multicolored hills. Additionally, the background music featured here is a cover of the Princess Peach's Castle theme from Super Mario 64. This page was last edited on August 5, 2018, at 09:03.